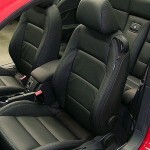 Auto Image Car Interiors has a reputation that extends beyond that of mainstream leather trim suppliers. Our breadth of experience in the entire design and fabrication process qualifies us as automotive image specialists. Our craftsmen have the skills and creative capacity to turn your ideas into stunning reality. Most leather interiors can be completed within 3 full working days, notwithstanding any special requirements. However, we will always confirm the expected completion date when booking and ensure your job is completed efficiently and to your complete satisfaction.